Showing 5 files from page Ranch Heights Monthly Calendars. Showing 5 files from page Ranch Heights Newsletters. The 42nd annual all-schools chess tournament has been set for Saturday, February 16, 2019 at Madison Middle School according to Carl Vickburg, who now coordinates the event. This chess tournament is again being conducted by the Bartlesville Chess Club in cooperation with the Bartlesville Public Schools. Students who may be interested in playing in the tournament may obtain information sheets and entry blanks in the office at each school or using the link below. There will be separate divisions for beginning (Kindergarten-3rd), upper-grade elementary (4th-5th), middle school (6th-8th), and high school (9th-12th) players, with awards to winning players in each division earning 2.5 points or better and participation ribbons. The 1st and 2nd-place winners in each division will receive a trophy. It will be a Swiss-system tournament in which each student will play four games, irrespective of the number of games won or lost, with a tie-breaking procedure or additional play-off game to determine winners if needed. Two games are played in the morning, with a lunch break, then the remaining games. See the entry form for further details. Robbyn Glinsmann, director of elementary mathematics for the Oklahoma State Department of Education, has seen direct benefits of chess in the classroom from her work as an instructional coach in Edmond Public Schools. Although the game does not target specific learning objectives, she says frequent gameplay can heighten cognitive skills needed to strengthen performance in multiple subject areas. Playing chess is a great equalizer, something anyone can learn to play. It is not restricted to gifted students. In fact, special-needs children have won state championships. Proponents say the game builds character, since players learn more from losing than from winning. Plus civility and sportsmanship are great traditions at chess tournaments. We encourage students of all ages to pick up an entry blank at their school office or print the form attached to this post. Just before Fall Break 2018, students and school staff members joined with representatives from sponsors Jane Phillips Medical Center and Truity Credit Union to celebrate the launch of Project Fit America at Ranch Heights. There was a ribbon-cutting ceremony followed by demonstrations by students of the new outdoor fitness equipment. The equipment is specifically designed to address fitness areas in which many children struggle. Brian Lawrence, director of operations at Jane Phillips Medical Center, thanked the school’s leaders and volunteers who helped install the equipment. Reporter Droege also quoted him: “We feel like a great place to start is with you young people. If we can teach you today the things that help keep us healthy and strong through exercise and different activities, then we know you’ll be able to give back to our community for many years to come, and that’s why this is important for us." A grant funded by Jane Phillips Medical Center and Truity Credit Union provided the Project Fit America (PFA) program to each school which includes state-of-the-art fitness equipment specifically designed to address the deficit areas where children fail fitness tests. The grant includes installation and a dynamic curriculum with games, activities, and challenges for kids with PFA outdoor & indoor equipment. The program also teaches character development, sportsmanship, teamwork, and leadership skills. The academic emphasis is to create “physically educated” children and to empower them to take personal responsibility for their health with enthusiasm. PFA also provides support to the schools for two years along with on-site training with each physical education teacher. 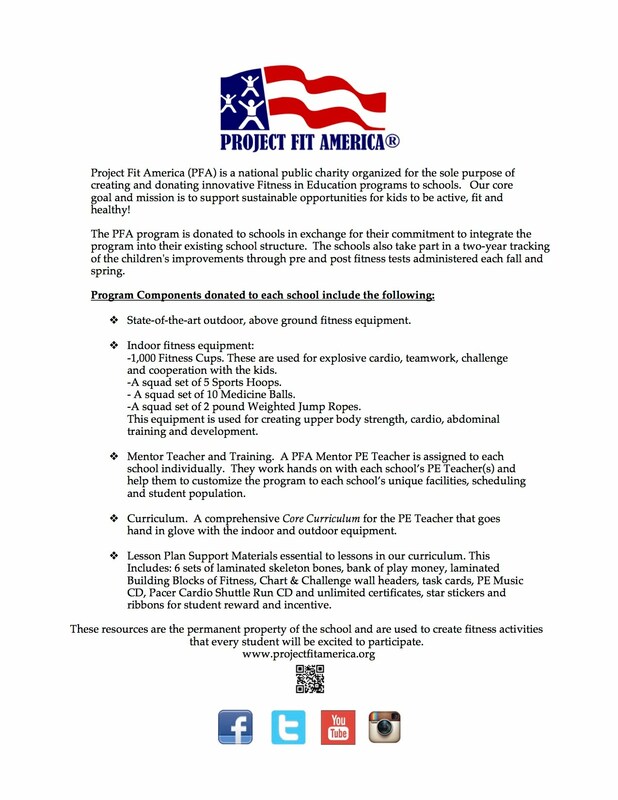 Five of the elementary schools in Bartlesville are now Project Fit America schools. Superintendent Chuck McCauley cuts the ribbon with students at Ranch Heights. Principal Chanda Myers is standing in the background. Bruiser the Bruin and others use new hula hoops provided for Ranch Heights. Students demonstrate some of the new outdoor equipment. 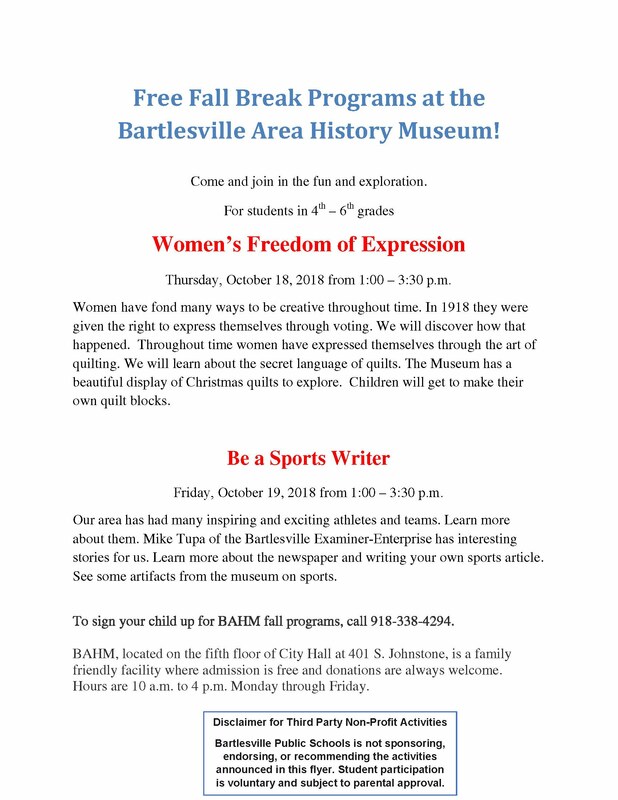 The Bartlesville Area History Museum will present two free programs during Fall Break for students in grades 4-6. To sign their child up for BAHM fall programs, parents should call 918-338-4294. Thursday, October 18, 2018 from 1:00 – 3:30 p.m.
Women have fond many ways to be creative throughout time. In 1918 they were given the right to express themselves through voting. We will discover how that happened. Throughout time women have expressed themselves through the art of quilting. We will learn about the secret language of quilts. The Museum has a beautiful display of Christmas quilts to explore. Children will get to make their own quilt blocks. Friday, October 19, 2018 from 1:00 – 3:30 p.m.
Our area has had many inspiring and exciting athletes and teams. Learn more about them. Mike Tupa of the Bartlesville Examiner-Enterprise has interesting stories for us. Learn more about the newspaper and writing your own sports article. See some artifacts from the museum on sports. The Bartlesville Area History Museum, located on the fifth floor of City Hall at 401 S. Johnstone, is a family friendly facility where admission is free and donations are always welcome. Hours are 10 a.m. to 4 p.m. Monday through Friday. Elementary and middle school students in the Bartlesville Public Schools are encouraged to walk or bike to school on Wednesday, October 10, 2018. The annual Walk to School Day is part of the City of Bartlesville's Safe Routes to School program. The international event is observed in more than 40 countries. It is an effort to raise awareness of the need for safe walking and biking facilities and to encourage students to take steps toward leading a healthier lifestyle. Each student who walks or bikes to school that day will receive a prize/treat to acknowledge their participation in the program, as long as supplies last. In 2017, City Grants Administrator Nancy Warring commented about the thousands of local students who participate annually. She said, "This event gives parents a chance to teach safe walking skills to their children. Plus it's good for the environment, and it reduces traffic congestion, pollution, and speed near the schools." "Parents are encouraged to walk with their children, park and walk from a remote location, or organize a walking school bus," Warring said. "For families who live too far away to walk or bike to school, parents are encouraged to drop their students off a few blocks from their school so they can participate." 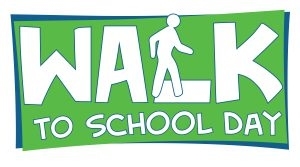 Walk to School Day was first held communitywide in Bartlesville in 2009, thanks to a grant awarded by the Oklahoma Department of Transportation to the City of Bartlesville to help facilitate the event. Volunteers and other program supporters will be posted at each participating BPSD site to greet students who walk or bike to school, including some area elected officials and local police officers and firefighters. 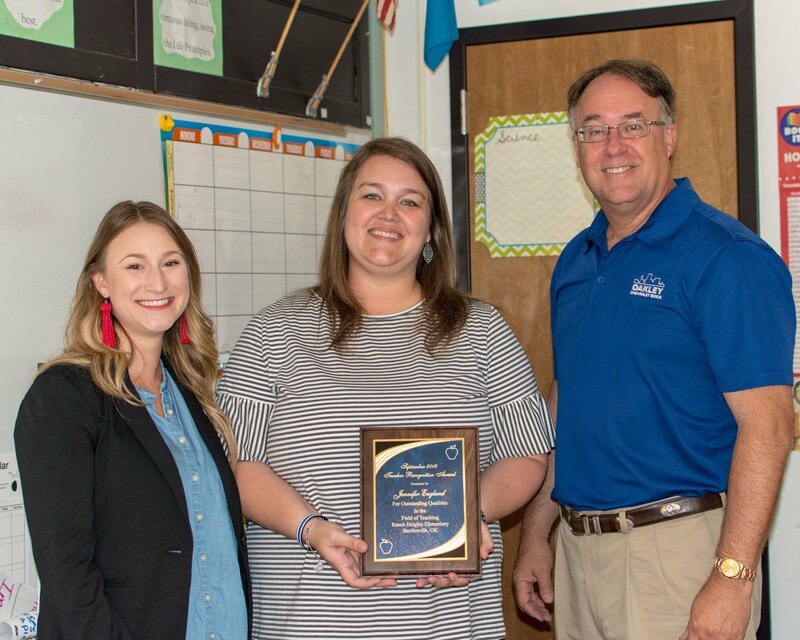 Jennifer England, who teaches fifth grade at Ranch Heights, has been named the Bartlesville Public School District Teacher of the Month for September by Arvest Bank and Oakley Chevrolet Buick. In recognition of this honor, Ms. England was presented with a plaque and a $300 check by Annah Fischer, Arvest Bank Marketing Manager, and David Oakley Jr., owner of Oakley Chevrolet Buick. Ms. England has 11 years of teaching experience. She has been teaching fifth grade for four years. Coming from a family of teachers, Ms. England knew the ups and downs of teaching, but she always viewed teaching as one of the most highly esteemed careers. “Being a Bruin throughout my entire schooling years, I was privileged to see many amazing teachers, and I know that helped me become a better teacher,” said England. Ms. England’s philosophy of teaching is that she believes each student wants to be seen and treated as a person, especially upper elementary students as they are becoming preteens and teenagers. She believes the students need to feel like someone cares about them so they will put more effort towards their education. She regards seeing a student who has perpetually struggled experience success as her biggest contribution. Ms. England researches different techniques that other teachers use in their classrooms and searches for new approaches to address standards with different hands-on methods. She enjoys going to Great Expectation workshops to learn new ways to involve students in each aspect of their education. As a native Bartian, Ms. England has grown up being a part of many different organizations. She volunteers in her church’s nursery and helps lead worship at her church. As a Pampered Chef consultant, she attends community events and craft fairs. Ms. England believes it is important that students see her being involved in the community not only as a teacher but also as a citizen and as a mother. Bartlesville Public Schools is proud to join Arvest Bank and Oakley Chevrolet Buick in honoring Jennifer England as a Bartlesville Teacher of the Month for September. Annah Fischer, Arvest Bank Marketing Manager (left), and David Oakley Jr., owner of Oakley Chevrolet-Buick (right), congratulate Jennifer England, a fifth-grade teacher at Ranch Heights Elementary School, for being selected a Bartlesville Teacher of the Month. In recognition of this honor, Mr. Oakley and Ms. Fischer visited Ranch Heights Elementary to present Ms. England with a plaque and a $300 check. 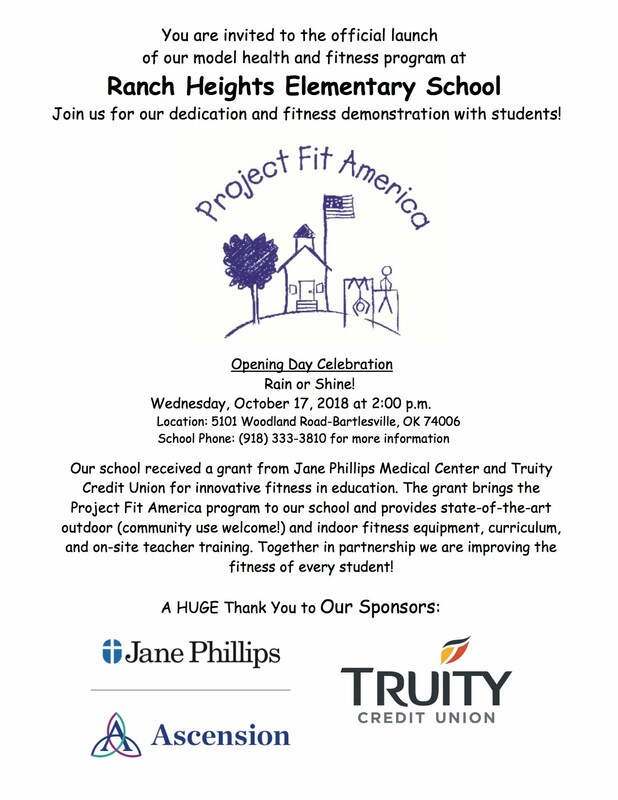 A grant funded by Jane Phillips Medical Center and Truity Credit Union provides the Project Fit America (PFA) program to each school which includes state-of-the-art fitness equipment specifically designed to address the deficit areas where children fail fitness tests. The grant includes installation and a dynamic curriculum with games, activities, and challenges for kids with PFA outdoor & indoor equipment. The program also teaches character development, sportsmanship, teamwork, and leadership skills. The academic emphasis is to create “physically educated” children and to empower them to take personal responsibility for their health with enthusiasm. PFA also provides support to the schools for two years along with on-site training with each physical education teacher. 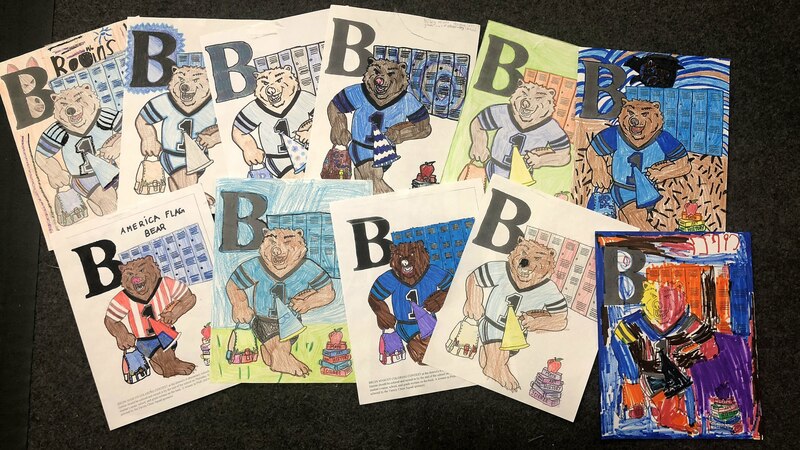 The cheerleaders received a lot of great entries in the Coloring Contest for their new mascot. 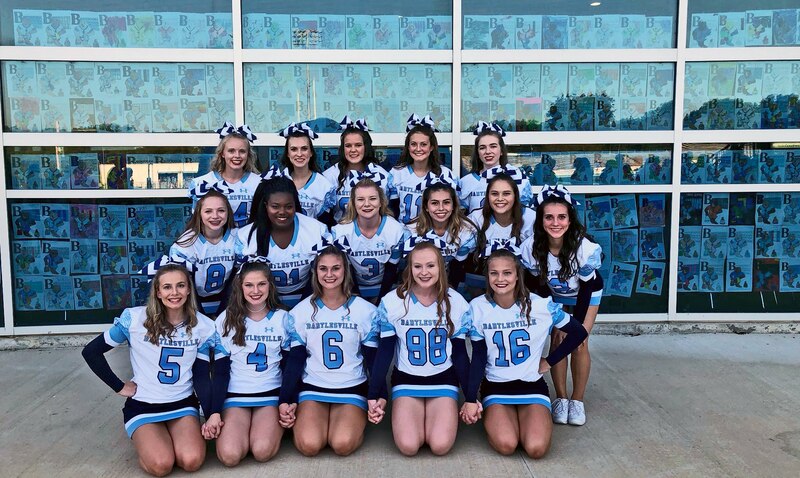 The cheerleaders posed in front of entries posted in the High School Commons before the game on 9/14/2018. The winning entries are shown at the bottom of this post. The Bartlesville Varsity Cheer squad is excited to announce the purchase and arrival of a new Bruin Mascot. 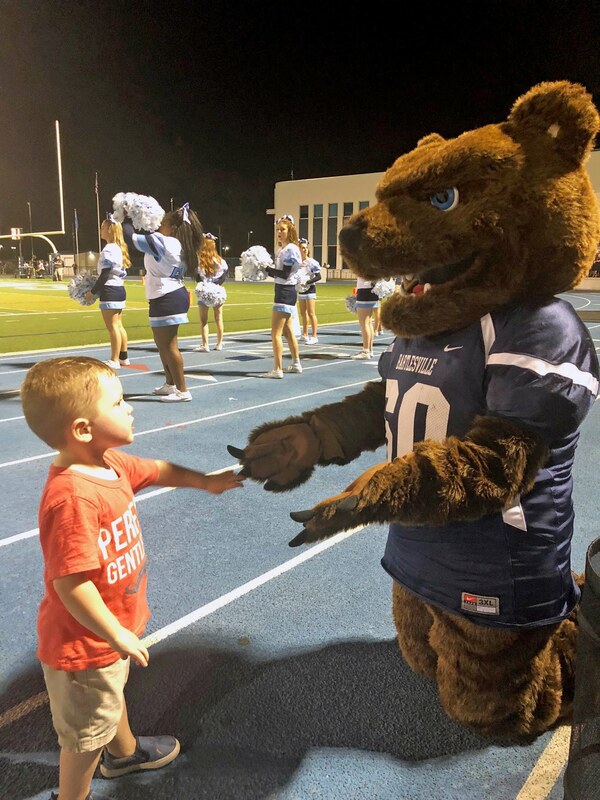 The athletic department has purchased the new mascot costume to replace the previous version, which had been used for several years and was beginning to show significant wear. Winners will be chosen for Pre-Kindergarten through 2nd grade as well as 3rd through 5th grade. Click here for a downloadable coloring page. 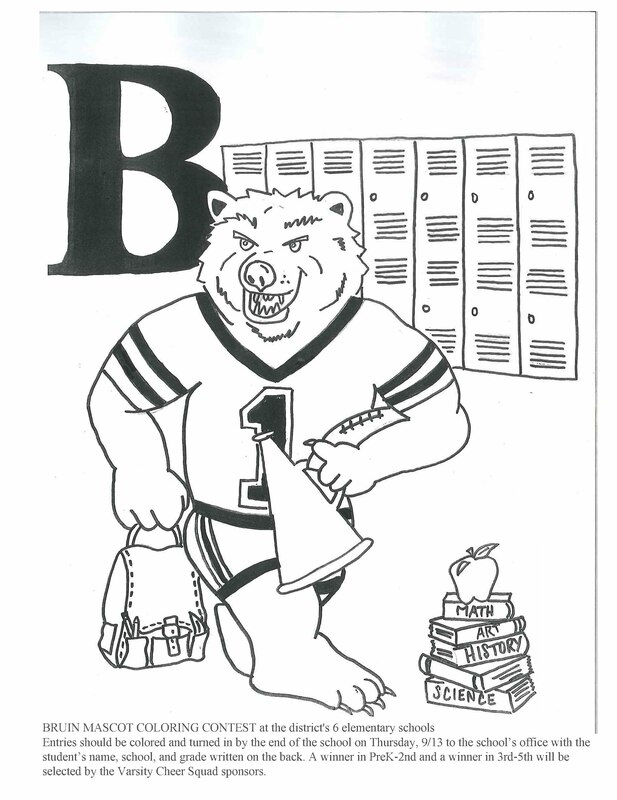 Coloring pages will also be available at all BPS elementary schools. Entries should be colored and turned in by the end of the school day on Thursday, 9/13 to the school’s office with the student’s name, school, and grade written on the back. 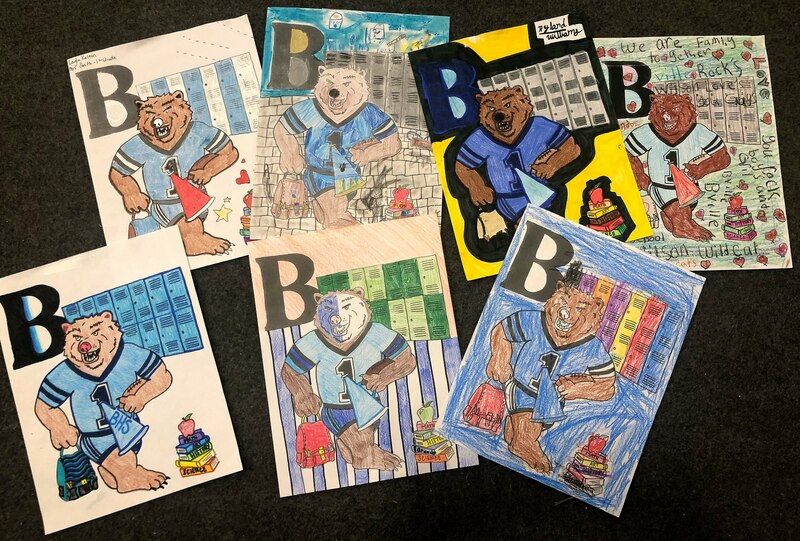 Coloring contest winners will be announced at the September 14th game and have the opportunity to have their photo taken with our new Bruin mascot! 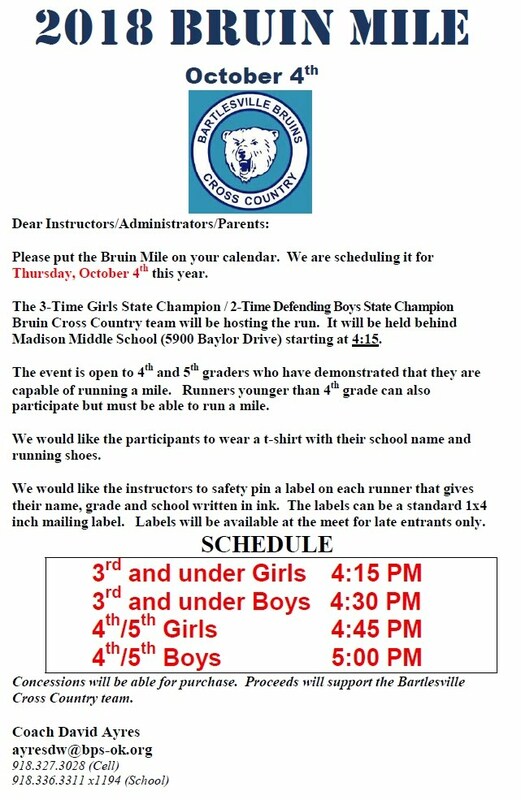 The Bartlesville Cross Country Bruin Mile will be on Thursday, October 4, 2018, at Madison Middle School after classes end for the day. The event is hosted by the three-time Girls State Champion and two-time Boys State Champion Bruin Cross Country team. Last year we had almost 500 runners. They hope to make the 2018 Bruin Mile the biggest ever. PTO ICE CREAM SOCIAL ON TUESDAY, AUGUST THE 28TH AT 6 - 7 P.M.